A hippy-styled acting troupe steps off their bus in the Israeli dessert to perform a rock opera about the last days of Jesus, as seen through the eyes of Judas. Being a traitor, it is not surprising that Judas gets a few things wrong and possesses a skewed sense of his worth in this historic saga. Even though we know how the story will end, the journey is both our reward and our pleasure. 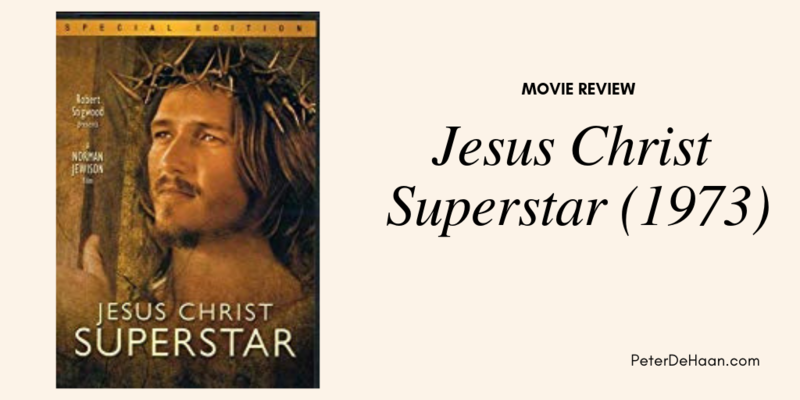 In anachronistic manner, Superstar treats us to juxtaposed realities of the modern with the ancient. Despite a dated 70s feel to the directing and choreographing, the music is timeless and inspiring. Whether you watch it for the first time or the tenth, the message and the music are sure to mesmerize. When this came out in the 70’s I was attending a very conservative church that thought it was blasphemous, so I didn’t see it. I saw it for the first time last year and though it was very unconventional…I was blessed, and yes, mesmerized. At the time, I think much of the church felt the same way. For me, it was the first time I saw Jesus connected with modern culture; it was life changing — and the music still mesmerizes me! I loved it then and would still love it today. I thought at the time, it was a bit sacririgious, but an avenue to reach a whole lot of unchurched people with the life of Christ. Is it on DVD? I’d like to see it again…. For the umpteenth time. I think I know all the words by heart.